I mean, I didn’t want to write a preview for these guys. I didn’t want to look at all their ugly faces on the NBA roster page. I didn’t even really like writing the team name at the top of this article and wish it was a little longer so I could come up with a hilarious rhyming nickname (the Brooklyn pets?). I laughed out loud when Nate Duncan called this the most boring team in the NBA and I will not be watching a single game of Pets basketball this year that does not involve my beloved ‘Bockers. Just absolute last in watchability. Well, out of curtesy let’s see what we can dredge up on these guys. Last year the Nets finished 38-44, good enough for a cellar-dwelling 8th seed in the East and a first round playoff exit at the hand of the Atlanta Hawks. They actually played pretty well in that series, using the length of Brook Lopez as their primary option and beating up an undersized Atlanta team that would later lose to Cleveland for largely the same reason. For Brooklyn to even make the playoffs, let alone take the series to 6 games is a pretty big overachievement for a team with the most apathetic fans in the NBA. 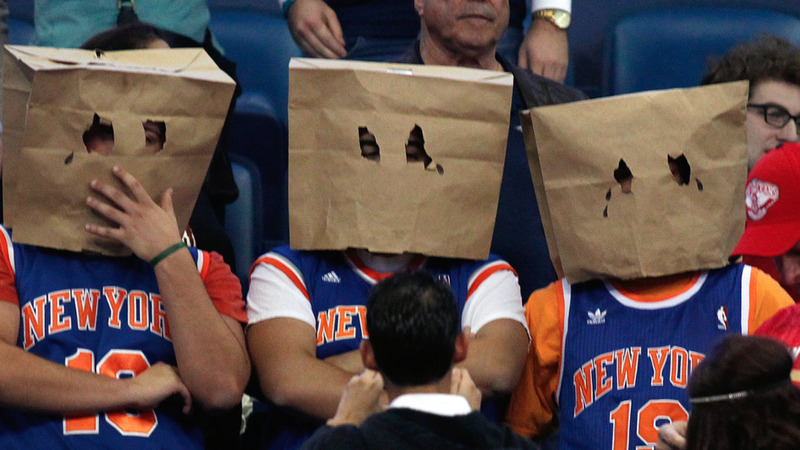 And when I say apathetic… at least when the Knicks are terrible, their fans are creative. The prototypical Nets fan is some dude who picked the team because he likes wearing black and spends the game texting while his girlfriend flirts with the Russian guys in the row behind them. Anywayyyys since that playoff loss, the Nets have spent their summer buying out Deron Williams‘ contract (a move that prompted Joe Johnson to claim “It’s not that bad here”), trading Mason Plumlee for the right to draft Rondae Hollis-Jefferson, and picking players off the odorous scrap-heap that was the worst team in Knicks’ franchise history. Yup, not gonna miss that pump-fake one bit. Enjoy throwing another terrible defensive big man next to Lopez. And, while I actually enjoyed small doses of Shane Larkin last year, I understand he doesn’t really have the size or shooting capability of a traditional triangle guard. Larkin may end up playing a fairly significant role for this Brooklyn team, though. Other than the peanut-head Jarret Jack (NOBODY BUY THAT DOMAIN NAME! IT’S MINE! ), the Nets don’t really have a traditional point guard on their roster. They managed to pry Donald Sloan away from Indiana (3 assists in 20 minutes a game and 30% shooting from 3!!!) and may be expecting to get a little something out of undrafted UCONN grad Ryan Boatwright. But given how the Nets liked to use Jack as a combo guard beside Williams and the advanced age of Joe “Old Man” Johnson its likely that Larkin will get a solid opportunity across the river. If I had a gun to my head, that’s gonna be the one thing I like about this team other than hate-watching Bargnani True Detective style. And I don’t know how much more there is to say. The Nets will likely try to win by going big in the frontcourt, beating teams in the post with Lopez and Thad Young and playing to Lionel Hollins’ strengths from his time in Memphis. Wayne “The Rain” Ellington should be a pretty useful acquisition here to provide some needed shooting around these two and maybe let the Nets go smaller with Joe at the 3. I’d also love to see any lineups that feature Lopez and Bargnani playing alongside one another and the resulting lay-up line on the other end of the court. Maybe I’d watch then… Maybe. Yup that’s about all I can muster. Even with an obvious downgrade in talent with Williams and Plumlee leaving, Brooklyn should still have enough to contend for the 8th seed in the East (sighhh). And when they make the playoffs and lose to the Cavs in four, I will tune in.